There are few words to express the anger and disgust at such egregious animal cruelty and neglect. 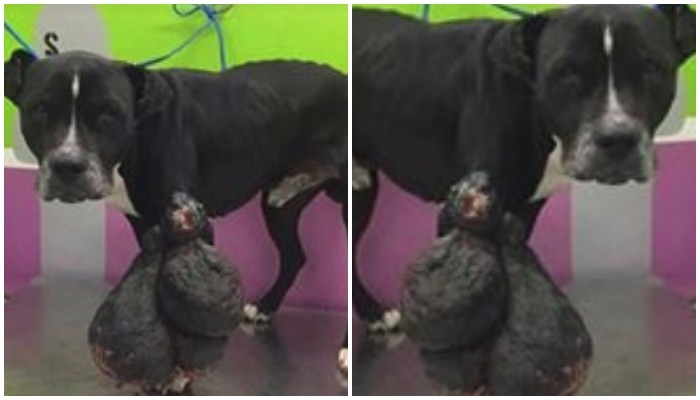 In southeast Dallas, Texas, Shadow was brought into a high-kill shelter by Animal Control with a monstrous sized tumor on his leg which weighs more than 20 pounds. At first glance, one would have thought there had been a black garbage bag tied around the dog’s lower leg – not so! And this poor dog, whose growth weighs more than half of the emaciated senior’s body weight, was left to live like this for an unspecified amount of time. This condition didn’t happen overnight. Rescued on Sunday by Dallas Dog RRR Rescue.Rehab. Reform, volunteers have expressed their anger directed towards anyone who may have seen Shadow and looked the other way. The words on the organization’s Facebook page addresses the appalling apathy and indifference to the needs of a gentle and kind dog. Shadow’s tumor is bleeding and he will needs immediate medical care. Dallas Dog RRR have partnered with Second Chance Rescue NYC and Tall Tails Rescue to help with Shadow. According to the rescue organization, criminal charges are expected to be pressed against the dog’s owner. To help with Shadow’s expenses, donations can be made by clicking here. 0 Response to "Dog Brought Into a High-Kill Shelter With Monstrosity of a Tumor Weighs 20 Lbs"